Let’s just cut to the chase and talk about the New York Fabric, eh? I think I’m in the minority, but I honestly love Spandex House. I love them for their vast assortment of all things Lycra. I’m all about making some bras. My favorites are $42 and I’m ready to save some money on those and I’d like some pretty bras! So, I got this pretty plaid, power netting, under wires, elastic, casing and black lace to make some. These were all from Spandex House and the findings are from Greenberg and Hammer. The fabric can still be found on to SH website (search ‘plaid’). I ordered several Kwik Sew patterns last night from PatternReview.com so I’ll be good to go soon. For garment sewing, I totally went the print route 🙂 The first and last are from Metro Textile. The chain link is a knit (def needs lining). The brown polka dot is from Spandex House and will be a cowl top (I hope. I only bought one yard when I thought they would be pan.ties). 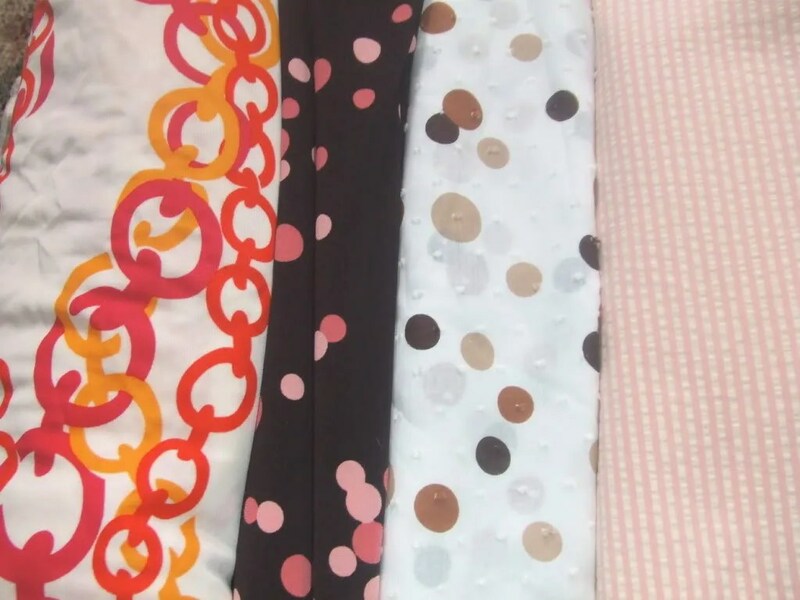 The polka dot swiss dot is for a blouse, and the pink and cream seersucker ahould be capris and a jacket for work. 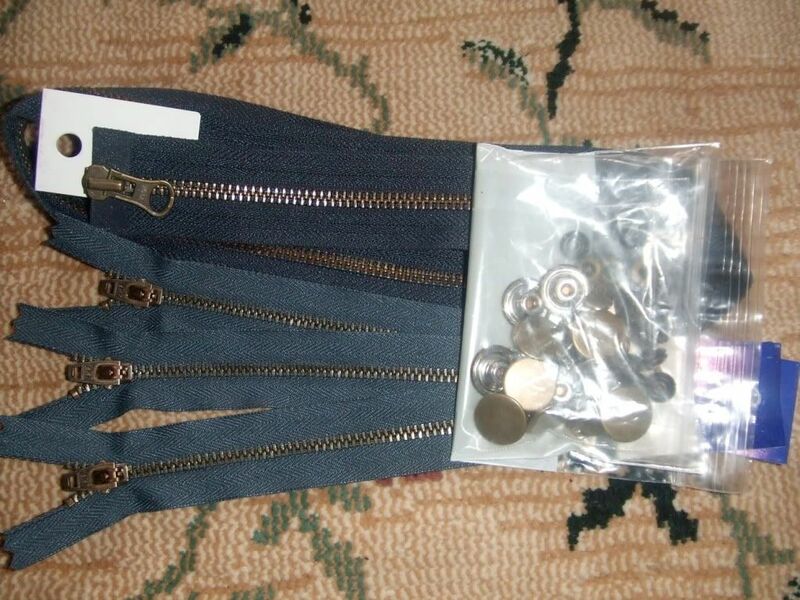 Finally, I got my zippers and rivets for my denim/sherpa biker jacket. What didn’t I get? I wanted something in yellow and I forgot to look for matte jersey for another Hot Patterns Cosmopolitan Dress. I thought I would this morning before I caught the bus, but my suitcase was heavy, it was starting to rain and it would have been a six block walk back to Penn Station. Despite the crazy prices, I feel like a trip to NYC requires a stop for cupcakes. I bought six. Ate three and gave two to my friend who picked me up from the bus stop. Red Velvet is hands down my favorite. Thank you NYC for starting the cupcake craze! As for the wedding, I wore a different dress than planned. My cotton dress was deemed not dressy enough by the assorted Aunts, Trena and my mother (via email). I must have known because I brought three dresses with me to Brooklyn! Which, I mentioned in our last Podcast is VERY similar to a dress in the June 2009 BWOF. This is only the second time I’ve gotten to wear this dress. I bought it from a clearance store about three years ago. 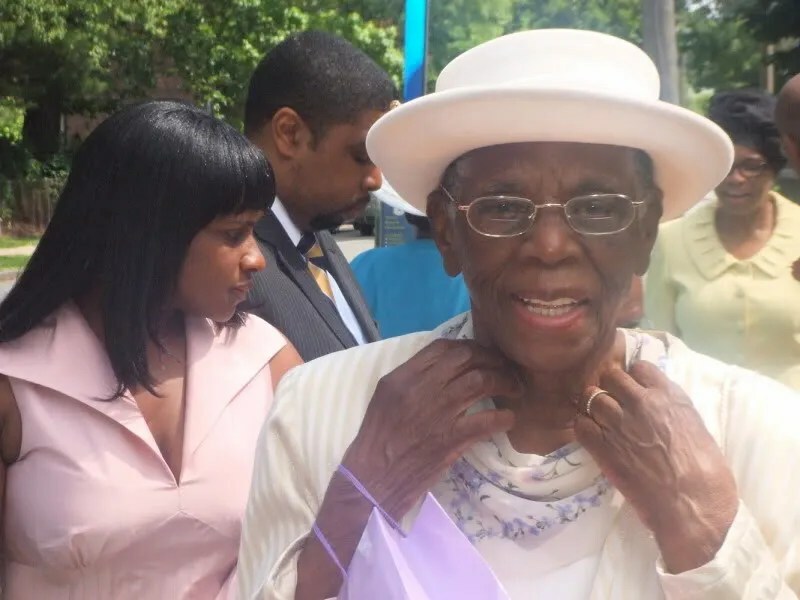 Finally, I also got to see my Granny this weekend before she heads back to Carriacou. Isn’t she styling at 86? 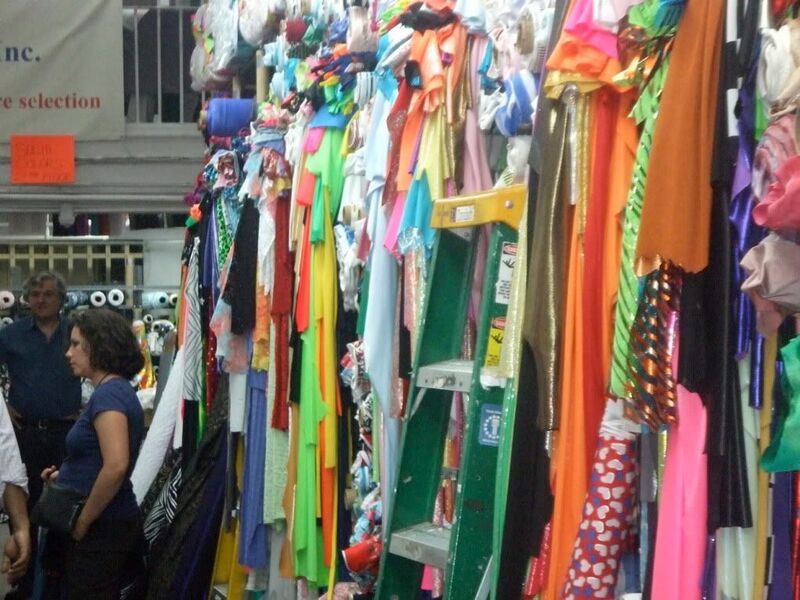 Those NY fabric stores must be overwhelming! Your grandma is totally cute! I can so relate to drama around what to wear to a wedding. I looked back at the green dress, which is also lovely. 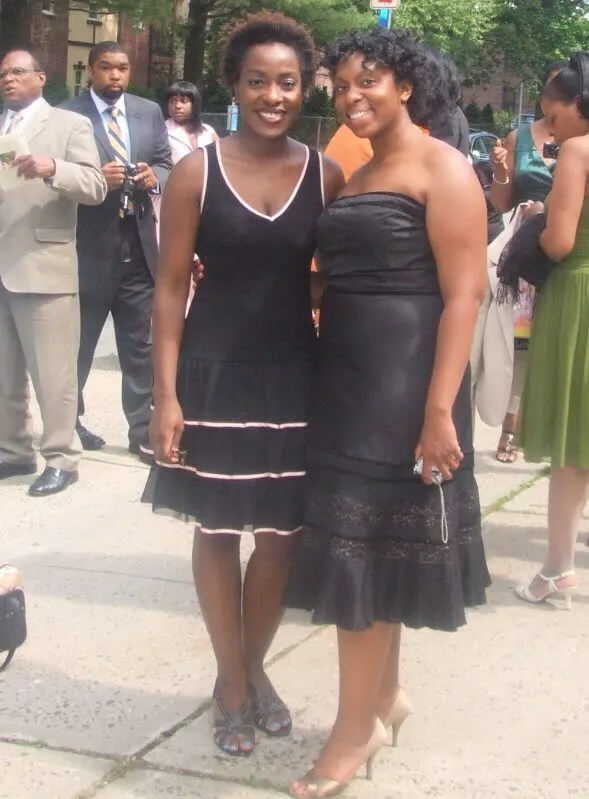 It reminds me of the 6 weeks spent coordinating an outfit to a wedding when I was in Accra, Ghana last year, when it was deemed my orange batik was too local, and all the hip girls were now wearing black and white to weddings. For my own wedding, I had the bridesmaids wear dresses that were different shades of green. I had an absolute fight with the designer making them in the cloth markets in Ghana on what constituted shades of green. I learned that with Cuban, Guyanese, and Scandi/Ghanaian to dress, green is a relative concept! Great finds. I always think Spandex House must be drag queen on the first floor! Your grandma looks tres classy, and I hear you ran from the bouquet toss. Smart woman! Oh, yes. I was out of that room so fast I was a blur. I hate the bouquet toss. I caught three in my 20s. I’m all stocked up. Your grandmother is one stylish woman! Tell her I want her hat! I also want that piece of fabric that Trena is holding. I already know what I would make with it and I have several garments that would match it. Did that come from Spandex House? I’m keen to see how the bra making goes. I just paid $75 for a sports bra. I’m so glad you had a good time in NY! I love Spandex House. I buy ballroom dance fabrics there. And I love me some cupcakes! People still do the bouquet toss? Your grandmother looks at least 20 years younger!! 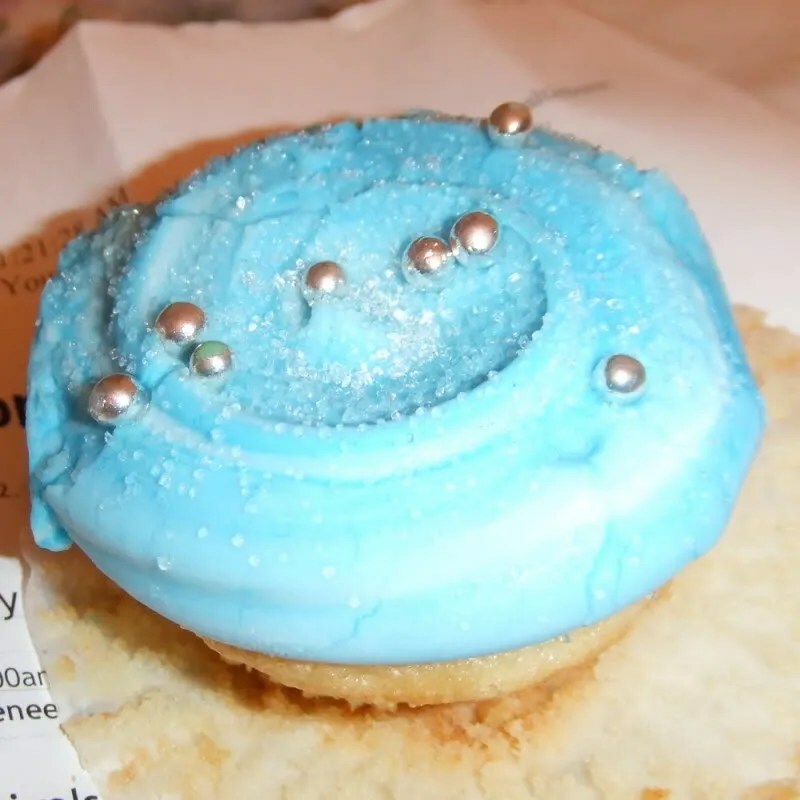 Check out the cupcakes I bought on Friday! You look fabulous in the black and pink dress! Nobody could fault you for that outfit. I hate the bouquet toss as well. Particularly as I go to friend’s weddings and there are fewer and fewer single girls. It is humiliating. You really were restrained in your fabric buying. We’ll have to fix that next time. Yeah. The last time, there were so few single women, they handed it to me. The time before that, they aimed it at me. Mortifying. I’m all done. I always find great stuff at Spandex House. You have to look a little harder but I think it’s worth it. I would have to work a lot of overtime to even think about NYC stores. Because there is no way I would be sensible. I especially like the dotted swiss fabric. I got accepted to nursing school this fall! What a great weekend – and family time to boot! I never have the patience for Spandex house, but I am not a print person which may be why I don’t love it. Your grandmother looks amazing! Look what you have to look forward to! Glad you had a good time. Waaaaaaaaaaaaaaaaaaaaaaaa! 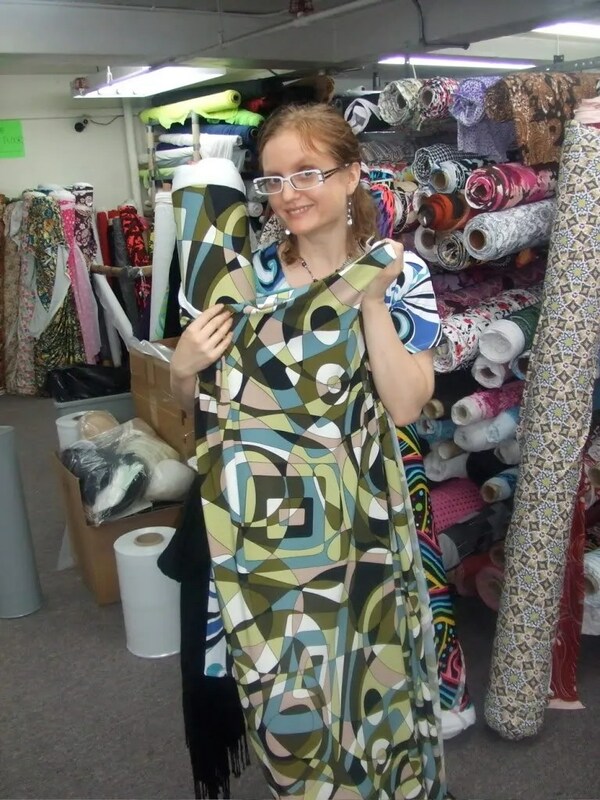 I wanna be in the fabric district…you lucky devils! I am so jealous you got that plaid at Spandex House! Looks like you had a great time. You look great in that dress. Now go copy it!! What a blessing to have such a fun granny. Looks like you had a great time! Thank you for sharing the family photos — weddings are always so fun! 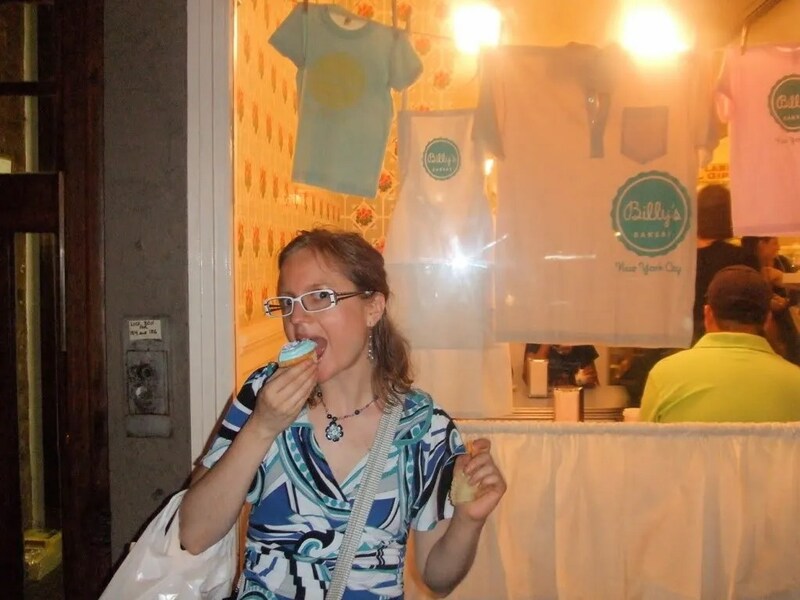 I didn’t know the cupcake craze began in NY — I’m totally addicted to them out here in California! Don’t know if this is the right yellow but Fabricmart has ITY yellow knit for sale in its “Over Stock Sale” category. Very good price. Great photos. first photo is really cool with fabrics. Fabric shopping and a wedding! What a fun weekend! It was great shopping with you and Trena last week! I loved the dress you ended up wearing and your Grannie is super cute. Funny coincidence, I bought that same swiss dot fabric at another store in the garment district a couple of months ago. I hope we meet up again when you’re next in NYC. I finally got to see the pix today…for all of 5mn. If I’m lucky, I’ll be able to post this comment, too! I love all the fabric in pic 4, too cute! And that chain mail knit might just convert me to the whole look (finally!). Thanks for the comment on my dress, btw. Just a little pick me up. I’m in dress mode for now and the forseable future, LOL! And keep us posted on the bra-making adventures. Mine are dying and I’m too cheap to replace them just yet. Some old ladies just take the “Damn the torpedos, full steam ahead” approach to dressing up, and it works really well! Would that we not-so-old ladies had the nerve to wear great stuff like that. Yes, Granny is Stylin’! I wish I could have gone fabric shopping with you, although my dearly beloved would really roll his eyes over that statement, and then ask, “So, where were you going to put this stuff anyway?” Debbie Cook embarked on bra-making adventures recently; she did quite well. I’m sure yours will be awesome, too! Looks like you had yourselves a great time! Your LBD was very nice and your Granny is too cute for words! Don’t you just love Grannies? I like Spandex House also. But it has been over five years since I was last in their shop. Heck they may have moved, but the stacks in your photo certainly remind me of my visit. Great fabric and notions haul. wow, you get a lot of comments! and you have an exciting life!! you pack more fun into a month than i’ve had in years!! Anyway, i’m lusting after that chainlink jersey!! Based on your earlier recommendation and photos, I just got the June BWOF and will be working on dress #107 this weekend! Thanks for the recommendation and information; I bought a BWOF last year but wasn’t impressed with anything . . . I just treated myself to a subscription based on the June issue (too much great stuff!). Now if I could just get up to the garment district in New York City . . . Your family has strong healthy genes. You will live a long and strong life. Your grandmother looks GREAT for her age!